In the world of clubbing, every country has “that city”, a city where inhibitions let loose and dreams become a reality. Las Vegas is that city for the USA, a blissful oasis under the dessert sun, which boasts some of the biggest parties found across the globe. Marquee, the day and nightclub attached to luxuriously modern Cosmopolitan, has become a leader in this industry, boasting some of electronic’s household names as residents. In fact Kaskade recently announced his Summer Lovin’ party here, which will span 12 weekends from May 4th to September 1st. As the brand grows with clubs in New York and Sydney, the aim has pushed passed that of pure entertainment to include the higher goal: the proliferation of EDM at large. With that in mind, Marquee has joined forces with Black Hole Recordings to produce a compilation series, featuring the club’s resident artists and affiliated DJs. The first release showcases a wide range of artists and genres, from veteran producers ATB and Paul Oakenfold to the new faces of Audien and Denzal Park. This series will give new listeners a stellar overview of the electronic scene, and allow enthusiasts a chance to brush up on anything they may have missed over the last year. 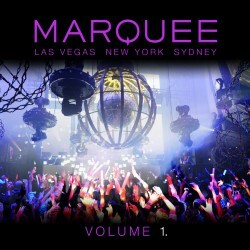 Download it today from iTunes for 33 tracks of listening pleasure, and make sure to see if your favorite artist is playing at Marquee next time you visit Vegas.